Bob K and Joe F. Speaking at the Los Angeles County Supervisors Meeting - speaking on the issues going on with Dockweiler and USHPA. Bob and Joe are at the Los Angeles County Supervisors Meeting to thank them for the change in the USHPA rules about flying at Dockweiler. Let's hear it for Los Angeles County Supervisors!!!! Fantastic! Joe and Bob you said the good and right things. I wish I could have joined you at the Supervisors meeting but I'm glad I was able to join you the day before, at the historic day at dockweiler. 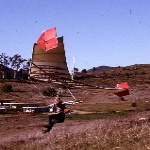 A day of true FREE FLIGHT, done the way it was in the beginnings of the world wide sport of modern hang gliding. Our own W W Condors (330 & 225) are on the way from Michigan, as we speak so, we can have these great gliders available, now the we are flying when Windsports Condors are not available for our use. I don't understand those on other forums who willingly want to pay and pay and pay again, to enjoy their sport when there are other ways available. BTW - See the photo in my profile. That is one of the hills I learned to fly on and I never paid anyone to qualify use it. Unfortunately, the LZ is now solid houses or I would be back there again for more fun in the sun. PS - Volmer Jensen soared that hill in his VJ23. He didn't pay anybody to qualify either. Stupidity is a quality or state of being stupid, or an act or idea that exhibits properties of being stupid. In a character study of "The Stupid Man" attributed to the Greek philosopher Theophrastus (c. 371 – c. 287 BC), stupidity was defined as "mental slowness in speech or action". The modern English word "stupid" has a broad range of application, from being slow of mind (indicating a lack of intelligence, care or reason), dullness of feeling or sensation (torpidity, senseless, insensitivity), or lacking interest or point (vexing, exasperating). It can either imply a congenital lack of capacity for reasoning, or a temporary state of daze, or slow-mindedness. In Understanding Stupidity, James F. Welles defines stupidity this way: "The term may be used to designate a mentality which is considered to be informed, deliberate and maladaptive." Welles distinguishes stupidity from ignorance; one must know they are acting in their own worst interest. Secondly, it must be a choice, not a forced act or accident. Lastly, it requires the activity to be maladaptive, in that it is in the worst interest of the actor, and specifically done to prevent adaption to new data or existing circumstances." Lantana — For James F. Welles, stupidity was not a banal quirk of life, but a social phenomenon worthy of scientific study. So much so, that he wrote two books about it. As Welles' perverse penchant illustrates, stupidity is a choice, not a forced act or accident. The fact that most of the people to which you refer have previously chosen to hang themselves high above the earth from laundry without a critical aerodynamic evaluation may be representative of the overall quality of their decision making. It will probably take centuries for these dimwits to realize that California Recreation Law is real and USHPA insurance is a scam. Ushpa has unwittingly unleashed the "Wrath of Khan". Rick Masters wrote: It will probably take centuries for these dimwits to realize that California Recreation Law is real and USHPA insurance is a scam. Fortunately, the Los Angeles County Board of Supervisors is helping to underscore Rick's point. Now we just need to start working on the other hundred odd sites around the country. I would prefer an analogy to the American Revolution or the Civil Rights Movement. But the "Wrath of Khan" shares some of those elements ... and is much more entertaining. Thanks Doug. I always enjoy your contributions.